The purpose of the Saints shall be to promote and administer the Youth football and and Cheer team's activities for the sole benefit of the team's members. The objective is to inspire youth, regardless of race, creed or national origin, to practice the ideals of sportsmanship, scholastic improvement, and physical fitness, while familiarizing all youth with the fundamentals of football and cheer. To additionally, provide the opportunity for youth to enjoy the game of football and cheer under supervised, organized, and in a safety-oriented manner, while keeping the welfare of the participants free of any adult ambition and personal glory. We do not hold tryouts. We are committed to developing every child. The TVYFL requires a set minimum play for all football players. 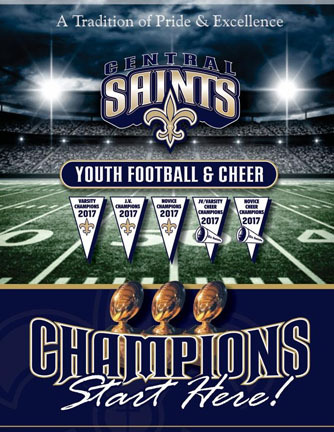 Congratulations to the 2018 Central Saints Cheer teams - Novice took 1st place, Jr Varsity took 2nd, Jr Novce took 3rd at JAMZ TVYFL competition. Congratulations to the 2018 Varsity football team who won the 2018 Super Bowl 26-0. The Central Saints season results starts with everyone including a Board Staff that sets up and manages "Our Tradition of Pride & Excellence", committed coaches willing to put in the time and team preparation and parents willing to support in any way! "WE" did this together and accomplished our goals as a unified program. Must fill out a Saints application and be interviewed by the Coaching Committee. Football coaches must adhere to the same short hair and attire policy as players and sign coaching contact agreement. The same standard of discipline and excellence that we require of the players are also required of our coaches. Anyone who desires to coach for the sole benefit of their child is not acceptable.